Praised for his independence, curiosity, intimate knowledge of French literature, and sharp reader's eye, John Taylor is a writer-critic who is naturally skeptical of literary fashions, overnight reputations, and readymade academic categories. 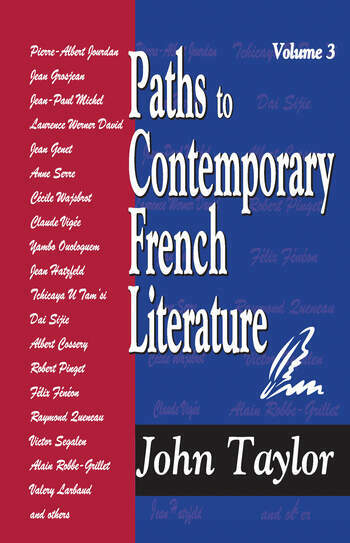 Here he examines various genres of politically committed literature (such as Jean Hatzfeld's "narratives" about Rwanda or Tchicaya U Tam'si's verse), some overlooked fiction, and several provocative experiments with literary form (ranging from the poetry of Jean-Paul Michel and Marie etienne to the "three-line novels" of Felix Feneon). Taylor continues to reveal the remarkable resourcefulness of French writing. Besides drawing attention to authors (like Dai Sijie or Albert Cossery) who have come to French from other languages, he has added younger novelists to his critical panorama. Challenging persistent cliches and recovering deserving voices from unjust neglect, Taylor's vision of French literature conjures up the image of a vital nexus. Poetry crisscrosses with prose, writers from one generation meet up with those from the next or the previous one, while the philosophical ideas underlying French writing are scrutinized. This is an essential guide to the realities of French culture today.